SPONSORS - COOKING WITH CONNALLY - Where You Become The Chef! We rely on our funders' support to bring our new high school Kitchen Classroom , Culinary Teaching Garden and Cooking Show to life. Their collective commitment enables us to harness the educational power of media and organic nature of a garden to benefit students and children in our community. We gratefully acknowledge the generous support of our current sponsors and partners, without whom our work to educate and inspire children would not be possible. Click here to learn more about us. Become a sponsor of our program and kids! We are currently looking for sponsors to donate food, equipment, and money to support our new Culinary Arts program. Next year we will be producing an 8 episode high school coooking show called- "Cooking With Connally - Where You Become The Chef!". Coming to the Internet, You Tube, and the PISD District website in 2012. For more information about becoming a sponsor contact mike.erickson@PflugervilleISD.net. Organizations can make an outright donation at any level to support Cooking With Connally efforts in the Central Texas area. 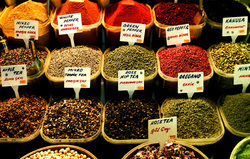 Spices are an important part of culinary education and learning the cuisines of the World. My goal as a teacher is to expose my students to as many different spices and cuisines from around the World. It may not seem like a lot, but donating at our Spice Sponsorship level will buy one container of spices the students can use to explore and prepare foods from around the World. We spend $500.00+ a year in spices and would love to feature a spice during each episode of our show as part of the students learning and education. - Brand placement as an underwriter of our cooking show on both television and web broadcast that would include Channel Austin and from our school District website. - Brand placement on a plaque in our Teaching Garden that is located directly in front of the school. - Recognition in all newsletters and press releases sent out. - Brand Placement at all six dinners on the student Power Point presentation to the guests. - Brand placement as an underwriter of 1 episode (your choice) of our cooking show on both television and web broadcast that would include Channel Austin and from our school District website. - Brand placement on 1 specific episode of our cooking show on the CookingWithConnally.org website episode page. - Acknowledgement in the text credits as an underwriter of our cooking show on the web broadcast from our school District website. - Recognition in all newsletters and press releases sent out as a sponsor of our program. - Plant placed in our garden in your honor.